Over 5 million Americans live with Alzheimer’s or other types of dementia, and another person is diagnosed every 65 seconds. For too long, the dementia story has been one of fear, shame, and isolation. But it doesn’t need to be that way. Around the world, communities are rallying together to become dementia-friendly. A dementia-friendly community is one in which people with memory loss and their loved ones are respected and included, and can participate confidently in community life. Want to learn more and get involved? Find resources below! The UW Memory & Brain Wellness Center is committed to building dementia-friendly communities alongside its partners. If you would like to talk more about how to spearhead dementia-friendly programs and initiatives in your community, please contact our Program Manager for Community Education & Impact, Marigrace Becker: mbecker1@uw.edu, 206-744-2017. In a dementia-friendly community, everyone in the community - from grocery store clerks to bank tellers to bus drivers – has a basic understanding about dementia and how to be supportive. Community spaces such as libraries, museums, and senior centers offer programs that are accessible to persons with dementia and their families. Meanwhile, systems like health care, transportation, and housing are set up to meet the particular needs of persons with dementia. As a result, people with dementia and their families remain connected and engaged rather than becoming isolated. Everyone can play a part in developing dementia-friendly communities. See below for inspiration, guidance, and practical tools at a local and national level. This dementia-friendly communities fact sheet for Washington State provides an overview and sample action steps you can take on an individual or community level. 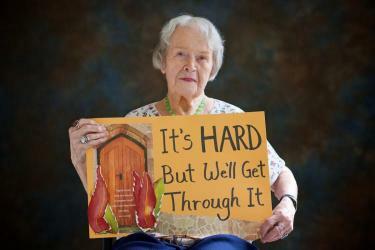 It was developed by the Washington State Dementia Action Collaborative. Dementia Friendly America provides guidance to communities that are working to become dementia-friendly, including a step-by-step process for bringing together community stakeholders, assessing the level of dementia awareness and supports within a community, and creating and implementing an action plan. Building understanding and challenging stigma are key foundations for a dementia-friendly community. Below are some tools you can use to build dementia awareness where you live. Dementia Friends USA provides a brief, free online training to become a “Dementia Friend” – someone who understands a bit about dementia and is committed to being supportive to others in their community. Take the training yourself, or share it with friends, neighbors, or co-workers. Alongside its partners in the Dementia Action Collaborative, the UW Memory & Brain Wellness Center is piloting in-person Dementia Friends trainings in King County and Yakima County in 2019. Learn more here. The UW Memory & Brain Wellness Center has developed an 8-week program, “Our Time Has Come,” which provides a structured opportunity for a group of people with memory loss to design and implement their own dementia awareness project. View an example project here. To bring this program to your community, contact Marigrace Becker: mbecker1@uw.edu, 206-744-2017. 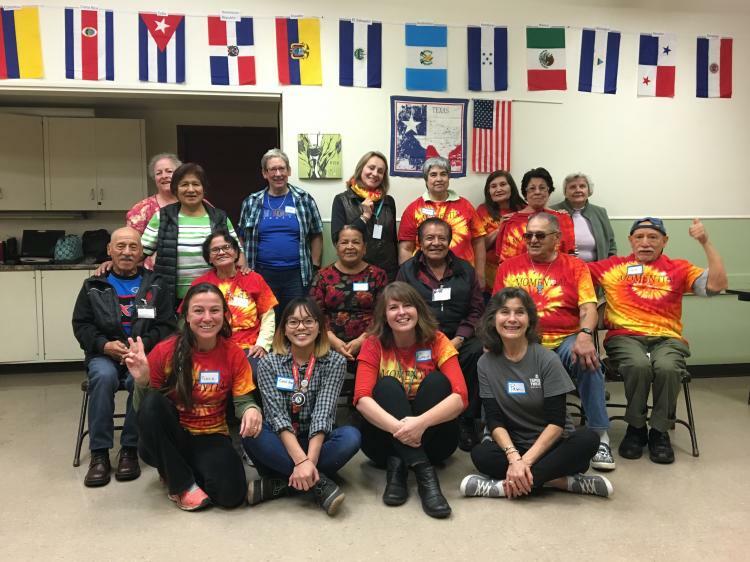 A local group of advocates, members of The Gathering Place early stage memory loss enrichment program at Seattle’s Greenwood Senior Center, have developed several resources for dementia awareness. You are welcome to use these resources personally or for any purpose related to dementia education, advocacy, and support. Their letter written to persons recently diagnosed communicates an empowering message about living well with memory loss. Their documentary, “Living With Memory Loss: In Our Own Words,” shares insights for the general public as well as for others living with memory loss. Download the full length documentary (16 min) here or watch the abbreviated version (5 min) here. Along with building awareness, another step in creating a dementia-friendly community includes advocating for the development of social programs that are tailored to and accessible to persons with dementia and their families. Examples include monthly meet-ups at the local coffee shop, improv workshops at the theater, or walking groups at the zoo. These “dementia-friendly” programs are based on the unique features of the community and the interests of the people who live there. Libraries, senior centers, museums, parks and recreation, arts centers, faith communities, YMCA’s, service clubs and more can all play a part. Read on to discover various models for dementia-friendly programs and how to bring them to your community. To learn even more, visit one for yourself! Alzheimer’s Cafes or Memory Cafes are the most common dementia-friendly program across the world, and one of the easiest to start. These are monthly social gatherings for people with dementia and their loved ones, in a relaxed community space such as a café or library. Nearly 20 Alzheimer’s Cafes meet regularly in Washington State; view a list here. Anyone can start one of these informal gatherings. The Dementia Action Collaborative offers a how-to guide. Dementia-friendly walking groups are also growing in popularity, with the chance to connect socially while getting exercise and enjoying the fresh air. Examples include Seattle Parks and Recreation’s “Out & About” neighborhood walking group. 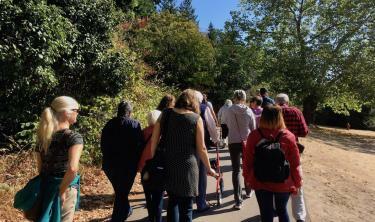 The Dementia Action Collaborative offers a dementia-friendly walking group how-to guide for community organizations that are equipped to offer public programs, such as senior centers or parks and recreation departments. 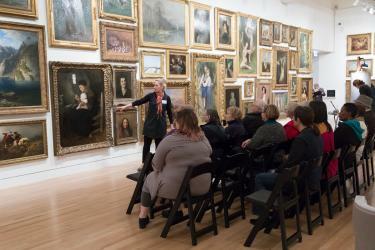 Museum-based programs for people with dementia are also on the rise, with a focus on present-moment experience of the arts in a small group setting. Examples include the pioneering Creative Aging programs at Seattle’s Frye Art Museum, and monthly art walks at the Bainbridge Island Museum of Art and Cascadia Art Museum. The Museum of Modern Art offers resources for starting an arts-based museum program, while Tunbridge Wells Museum & Art Gallery in the UK offers a toolkit for other types of museum experiences. 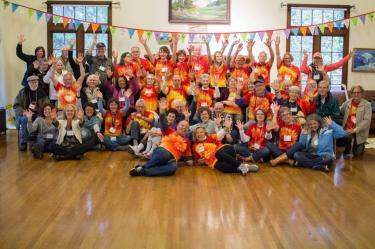 Momentia Seattle is a grassroots movement empowering people with memory loss and their loved ones to stay active and engaged in the community. Visit the website to discover a variety of arts, fitness, social, and volunteer programs offered by a growing number of organizations in the Puget Sound region. Additional examples around the state can be found on the SnoMentia Facebook Page for Snohomish County, the Momentia Bellingham website, and the West Seattle Momentia Group Facebook Group. Ready to start a dementia-friendly program in your area? View these “5 tips” developed by collaborators in the Momentia movement. Do you want a more structured process for community-engaged program development? The UW Memory & Brain Wellness Center provides guidance, tools and materials for an approach called “Momentia in My Neighborhood,” which brings together local organizations, people with memory loss and their loved ones, to design unique dementia-friendly programs for their region over the course of nine months. Contact Marigrace Becker for more information: mbecker1@uw.edu, 206-744-2017. For questions or more information, please contact our Program Manager for Community Education & Impact, Marigrace Becker: mbecker1@uw.edu, 206-744-2017.